Resuelve tus dudas sobre el cebador UFISHPRO y descubre cómo acercar la pesca hasta tus anzuelos para sacar el máximo partido a tu jornada de pesca. Why is it important to use the chum dispenser from the moment you set off? When you head out fishing, the idea is to make the most of your time and head back to dock with a day’s haul you can be proud of. But the sea is expansive, and when fishing from a boat, it can be hard to attract the attention of only the catches you want with the bait on your hooks. That is why it is common to use the chumming technique to attract fish. Two components are used for chumming: a chum dispenser, and the lure paste that is placed inside. Oil diffuses minced fish from the paste and attracts the attention of fish, which are capable of detecting scents and flavors though particles that are dissolved in water, even from a great distance. The chum dispenser is hung from the boat right next to our tackle at the depth where the species we want to capture swims. Lure paste is diffused to produce a cloud of particles that lures the species we want, as well as small feeding bait fish that attract larger predators. How do I fill the chum dispenser with lure paste? There are different types of pastes found at specialty stores that are made from fish scraps, such as anchovy bait. Use a small spatula to load the chum dispenser cleanly, without dirtying your boat’s deck. Only fill the chum dispenser to a point where the plunger still has room for a path that allows the chum dispenser to work correctly. How long does paste last when using the UFISHPRO chum dispenser? In contrast with other chumming systems, the UFISHPRO chum dispenser helps save lure paste, which leads to big savings over the course of the year. Homemade chum dispensers and other types of devices lose paste even before they are placed near hooks. Tests have shown that a single load can last almost all morning, offering two benefits: not having to constantly raise and lower the chum dispenser, and cash savings on paste that can add up over the course of the year. If your vessel has a radar, you can check if the chum dispenser is still chumming, or if the bait has run out. Remember that if there is still paste in the chum dispenser when you remove it from the water, you can mix it back in with the chum in your bucket and reuse it the next time you go fishing. How can I ensure my chum dispenser lasts a long time? Make sure the top cap is properly closed. Always keep the top cap’s screw clean and ensure it is properly closed before placing the chum dispenser in the water. This way, you won’t lose it. The screw top can be a little difficult, but this helps ensure that it does not come off underwater. Make sure that the chum dispenser does not hit bottom or get snagged. The material is highly resilient, but it is better not to knock it against rocks so that its functionality is not altered. Clean it well before storing. When you take the chum dispenser out of the water, check to see if there is still paste inside, and extract the remaining chum to use another day. Then, place the chum dispenser in the water, hold the rod tightly by the end of the eyebolt, and shake it on the surface to help clear any remains. Just like you would with any of your other fishing equipment (rods, reels, etc. ), rinse the chum dispenser with fresh water before storing it. Why should I use weights on the chum dispenser, and how do I add them? The chum dispenser has been designed with different ways of adding weight so that you can adjust chumming to your day’s conditions, such as varying tides and waves, or the location where you are fishing. Adding weights to the plunger container is important to ensure that the chum dispenser stays in place under the boat, and so the piston works properly to automatically push out a constant stream of paste without clumping. Lead weights can be added to, or removed from the lower cap (remember to store it properly so that it is not lost), and weights can also be hung from the lower ring. That will depend on your needs and preferences. You can store weights in the interior container and lower cap until your next outing. What part of the boat do I attach the chum dispenser to, and how do I do it? 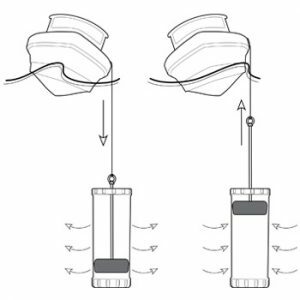 The best option is to hang the chum dispenser from the port or starboard side. Make sure to use a rope that is not too thick, attached to the upper eyebolt on one end and the boat on the other in order to keep the chum dispenser from being dragged away from your tackle. Be careful when casting your tackle so that your line does not become entangled with the chum dispenser rope. How do I adjust paste dispensing? The chum dispenser has two levers that can be operated with both hands. Position 0: the chum dispenser’s side slots are completely closed for clean filling. Once filled with paste and attached to the side of the boat, you can select your desired settings and drop the chum dispenser into the water. Positions 1 through 3: select the setting that best fits your way of chumming, whether you prefer less chum over a longer period of time, or if you want to chum quickly. Test out the options and place the levers to your liking. How do you ensure a constant and automatic flow of paste? The movement of the waves is used to ensure the paste flows out constantly, evenly, and automatically. This is achieved thanks to the plunger found within the chum dispenser. The plunger rises and falls as water flows in and out, causing a suction effect that moves the paste through the interior that keeps it from compacting or solidifying, and helps with dispensing. Paste does not begin to come out until the chum dispenser is set at the desired depth, which saves wasted chum on the way down. Once attached to the boat, the plunger begins to move, pulverizing the paste so that the cloud of chum particles expands out further, and increases your chances of reaching more prey.